FAMILY and friends of “inspirational” West Belfast man Paul Martin Floyd held a 10k fundraiser in Fermanagh at the weekend raising £6000. Paul passed away at the end of August following complications after a bone marrow transplant. In the wake of his tragic death his close friends Kevin Fox, Michael Massey and Clare McQuillan organised the run at the Marble Arch Caves on in memory of the former La Salle Pupil. Kevin explained that the idea of holding the walk at the ‘Stairway to Heaven’ attraction started off in a light-hearted way. Diagnosed with leukaemia at the age of 16, Paul had undergone chemo and went into remission. However, at 19, when it returned, Paul had a bone marrow transplant and developed ‘graft versus host’ disease. Paul then suffered two strokes but through rehabilitation was able to walk again with a walking stick. “He was an inspiration and taught us that with the right frame of mind and hard work and determination you can achieve anything,” added Kevin. Paul passed away on August 29. He was just 29 years old. “He had a tattoo of the superhero Flash on his arm. In fact, we used to joke and call him Flash when he needed the aid of a walking stick,” recalled Kevin. Family and friends decided to take Paul’s walking stick along to the event on Saturday. 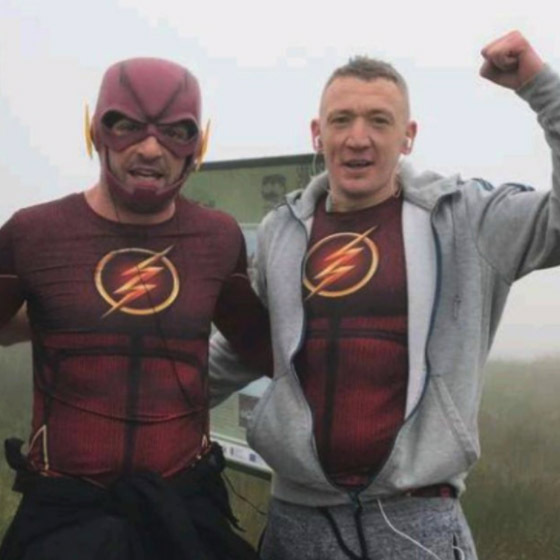 Going one step further, Kevin and Michael donned Flash costumes to complete the run. “We organised a coach down which was filled with about 40 of Paul’s friends and family taking part. There were about six or seven of us who ran the whole way up. It was the steepness and the fog that challenged us more than anything. It might have been a challenge but the struggle was nothing compared to what Paul had to go through. Although the foggy weather robbing them of the breathtaking view at the peak of their journey, Kevin said it was all worthwhile as they began totalling up their sponsorship forms on the return journey home. “We’re just delighted to raise these funds for the Make a Wish Foundation who make a wish come true for children and young people with life-threatening illnesses. Thanks to them Paul got his wish to met Kanye West,” explained Kevin. “Every penny that goes to them will help a young person achieve something which they may find impossible. We would like to help others in Paul’s name – he can achieve just as much after his passing as he did when he was alive. Since they were founded in 1986, Make A Wish has fulfilled the dreams of more than 11,000 seriously ill children and young people. In 2016 alone it granted 984 wishes, its biggest year to date. In 2017 it granted over 40 wishes across the north alone.